I met Kayti and Frank for coffee a few months ago and I immediately fell in love with this sweet couple. As we were chatting and getting to know each other, I found out that Frank is an avid fly fisherman, and that he and my son are good friends. (My son loves fly fishing as well.) Kayti and Frank decided on a very cool location for their engagement shoot. Since Frank has such a passion for fly fishing and Kayti enjoys fishing with him, they decided to have their engagement shoot at The Big Spring Creek, which is a special spot in Pennsylvania where they both enjoy visiting and have spent a lot of time together. 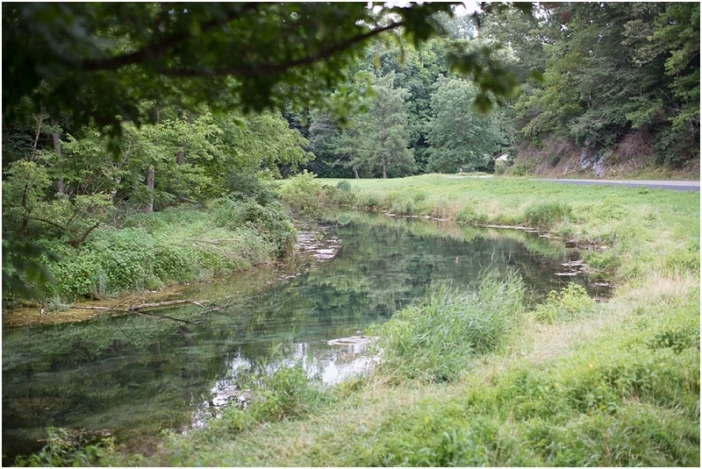 The Big Spring Creek is one of the world’s most productive limestone spring creeks. I was so amazed at how clean and crystal clear the water in the stream was. Kayti and Frank also decided to bring their pup, Doug, along for a few pictures. What a fun time hanging out with this sweet couple. I am really looking forward to celebrating your wedding with you next June! Anastasia and I talked on the phone and emailed back and forth many times, but we did not meet for the first time until their engagement shoot in Charlottesville, VA a few weeks ago. What a lovely couple they are! Anastasia and Chris chose Darden Towe Park in Charlottesville by the Rivanna River for their fun engagement shoot. They also brought their sweet pup, Frisco along. (I love it when couples include their pups in their engagement shoots.) We had such a lovely visit and a nice stroll along the river. I can’t wait to celebrate with you guys as you begin your marriage in August! Rachael and Jeremy are married! And what a sweet couple! Their lovely outdoor wedding took place in the shade under the majestic oak trees on the lawn at Weaver’s Mennonite Church in Harrisonburg, Virginia. The weather was just perfect for an outdoor wedding. Well, OK, it might have been just a bit humid, but I would take a little humidity over rain any day for an outdoor wedding. 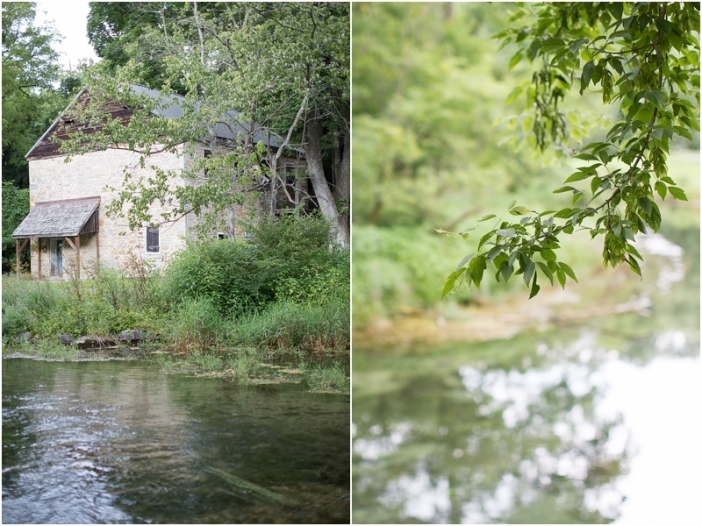 Rachael and Jeremy decided on a rustic theme for their wedding since the bride and groom both love the out-of-doors. Pinecones, moss, tree stumps, green, white and yellow flowers, a bird’s nest, a stone fireplace, potted plants, etc…and wait till you see what the groomsmen boutonnieres were made of! The groomsmen also wore matching camouflage socks. So cute! I love the rich, green, earthy colors that Rachael chose for their special day. During the ceremony Rachael and Jeremy each planted Jasmine in one flower pot to symbolize their love for each other. Rachael’s mom, Joy, who has a passion for flowers, was the perfect person to provide and arrange all of the gorgeous flowers and centerpieces for the day. The bride and groom have known each other for quite a number of years since they were high school sweethearts and also attended the same college. It was easy to see that these two are the best of friends and have so much love to share. Rachael and Jeremy, thank you so much for inviting me to be a part of your lovely wedding day! I wish for you many years of happiness, love and adventure! You did a wonderful job with their pictures. Absolutely beautiful! Bride, flowers, photography,everything! Well done! What can I say about this adorable little girl! Kailyn is 9 months old and as sweet as they come! I am working on a new studio space in my home and what a perfect little model Kailyn was for me to check out my lighting. These pictures were all taken with natural light from a double window in the room. Thanks, Kailyn, for posing so beautifully for me and for helping me test out my new studio! To celebrate her daughter’s second birthday, Amelia of Amelia Marie Design, hosted an outdoor “Glitter & Gold” party for Amiah and three of her friends. Amelia designed the event to reflect the birthday girl’s bright and vibrant personality. A handmade tent showcasing a gold gumball machine and jewelry offered a fun space for the little ladies to play. Featuring a stunning pink and gold cake and personalized place settings for each guest, the party table sat nearby adorned in soft pink, gold, and glitter. They had a special surprise when one of the little girls brought her little 7 week old puppy to join the party! What a fun time they had taking turns holding little Summer, a designer pup that is part Chihuahua and part Jack Russell. This glittery gold birthday took place under a lovely weeping willow tree beside of a beautiful little pond in Bridgewater, Virginia. What more could a little girl want! They munched on delicious cupcakes, sipped ginger ale out of pink and white straws, played in the tent, whispered secrets to each other and had a wonderful time celebrating Amiah’s 2nd Birthday. Oh my. What little girl would not love a party like this! Friends and family gathered to witness the love between Jessica & Edgar who were married at the lovely Winery and Vineyard at Lost Creek in Leesburg, Virginia. Jessica was so stunning and she was one of the most relaxed brides that I have ever worked with! What a perfect day it was. Their wedding ceremony was planned on being held in the backyard of the Harvest House at Lost Creek but with raindrops continuing to fall all afternoon, their ceremony was moved indoors. Not a problem at all for Jessica & Edgar who were both so cool about the whole day. The only thing that really mattered was the obvious love between these two. Jessica and Edgar, thank you so much for inviting me to be a part of your special day. I had such a great time meeting you and your friends and family. I wish for you many wonderful years of love, peace and happiness together!